The “Pop-Up Public Health Fair” toolkit was born out of the UCLA Community Scholars program and was created by the Healthy and Green Communities working group. It is designed to create a step-by-step manual on how to put together a health fair and other related public events in and around MacArthur Park. We hope that this manual will assist community organizations and nonprofits in navigating the City’s bureaucratic public event planning process by making the process clear and simple. The goal is that the toolkit will lead to more active and regularly occurring events at the park, bringing about an active community that promotes both health and civic participation for Westlake residents. 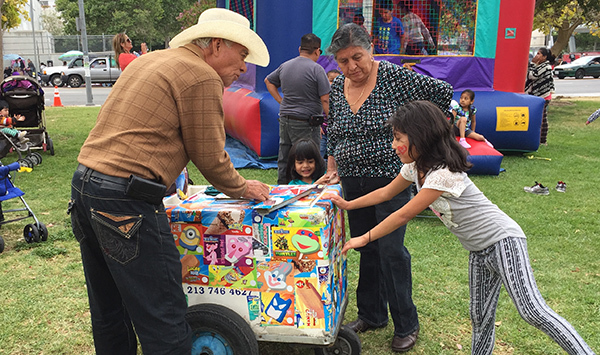 The “Pop-Up Public Health Fair” toolkit was designed and guided by the organizing of ¡Fiesta Salud!—a pop-up public health fair that was held in MacArthur Park to celebrate and promote healthy living. The process of organizing ¡Fiesta Salud! and the lessons learned from this event served as the blueprint for the toolkit. ¡Fiesta Salud! was organized by the Community Scholars Healthy and Green Communities team to better understand, survey, and engage the Westlake community, and to bring much needed health resources to the area.